As you’ve no doubt heard, Gilmore Girls will return after a lengthy absence this Friday, November 25, with four season-themed episodes on Netflix, just in time for your tryptophan-induced binge-watch. But what if you’re a GG novice? Do you really have to slog through seven seasons to fully appreciate that Stars Hollow magic? Fear not: The A.V. 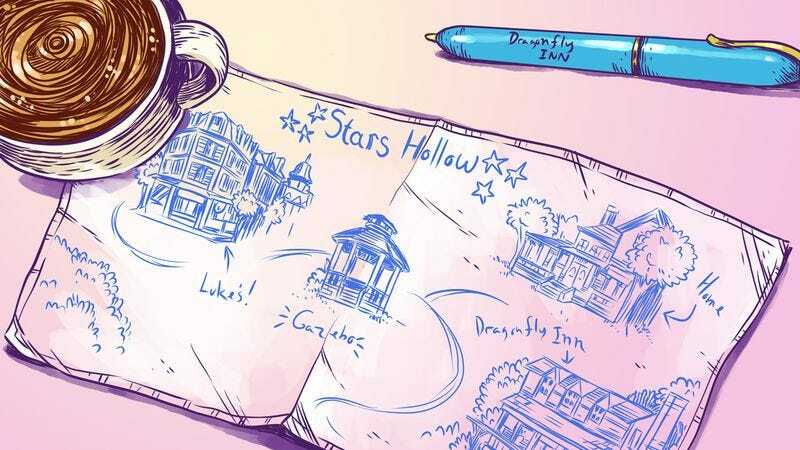 Club is here to help with our quick-and-handy road map to Stars Hollow. Our writers have taken on a season or two, added a helpful summary, and chosen some categories to streamline your binge. “Must-stops” are can’t-miss episodes. “Drive-bys” are episodes you can absolutely skip. And “roadside curios” are fun-but-nonessential departures that capture the quirkiness that is Stars Hollow and its inhabitants. It’s why we’re all so excited about the show’s return in the first place. The GG return is only days away, so get cracking! We suggest fueling yourself with lots of high-octane coffee to get through as many episodes as possible. Y’know, just like Lorelai and Rory. Welcome to Stars Hollow! Gilmore Girls does an excellent job of quickly immersing you in the town and the backstory behind its two most popular residents. We meet Lorelai Gilmore (Lauren Graham), former teen mom, who left her posh home to raise her daughter in a small, welcoming, slightly weird town. As Rory (Alexis Bledel) grew up, Lorelai worked her way up from being a maid to a manager at the posh local hotel, the Independence Inn. We meet her best friend, the clumsy yet gifted chef Sookie (Melissa McCarthy); her flirting/sparring partner Luke (Scott Patterson); her long-suffering assistant, Michel (Yanic Truesdale); and most importantly, the parents she left behind, Richard and Emily Gilmore (Edward Herrmann and Kelly Bishop). When Rory gets the chance to go to a posh private school, Lorelai is forced to reenter her parents’ lives for the first time in a long while. Season one offers a lot of portraits of Stars Hollow at its quirkiest. This is a town that shuts down to attend a pet funeral, after all. Lorelai spends her time navigating wedding ice sculptures as she juggles various admirers like Rory’s teacher Max Medina (Scott Cohen), the always elusive Luke, and Rory’s deadbeat father, Christopher (David Sutcliffe). Rory gets teased by Tristan (Chad Michael Murray) as she tries to make her way in a new upper-crust world, but in season one at least, she only has eyes for the guy who builds her a car, Dean (Jared Padalecki). Pretty enjoyable, lightweight stuff, but season one offers glimmers of the knock-down drama that would become the series’ high points. In “Rory’s Dance,” she and Dean accidentally stay out all night, leading to an all-hands-on emotional brawl between Lorelai and Emily, followed by a similar one between Lorelai and Rory. Gilmore Girls was always going to be a fun watch, but acting performances like these help explain why it has remained so beloved for so long. For as great as some of the episodes in the third season are—“They Shoot Gilmores, Don’t They?” is a masterpiece—there are also a lot of genuinely mediocre ones here. As soon as Jess and Rory get together, their relationship gets mired in petty jealousy on his part and general apathy on hers. The chemistry that made their coupling so interesting quickly fizzles. But those lackluster episodes are easy to shrug off. Two that you should definitely wave bye to are ones in which the show attempted to break from its usual rhythms for a gimmick. In “Dear Emily And Richard” we get an unnecessary flashback to Rory’s birth with a young actress in the role of Lorelai who is doing a pale imitation of Lauren Graham’s style. “Here Comes The Son” features the backdoor pilot for the Jess spin-off, taking his fish-out-of-water shtick to California. It’s better that it never came to fruition. Outside of the dance marathon, the crowning moment of the season belongs to Paris Geller in “The Big One.” Liza Weil’s performance is a tour de force as the overachiever breaks down in spectacular fashion upon learning she didn’t get into Harvard. The incident is beautifully framed—not as payback for the character’s years of nastiness, but as a painful life lesson. Speaking of college, the setup for Rory’s ultimate choice of Yale begins in “Let The Games Begin,” which balances some lovely intergenerational Gilmore moments, with Richard’s ultimate hoodwink: getting Rory an interview at his alma mater without telling her. There are plenty charming but inessential installments: “A Deep-Fried Korean Thanksgiving,” for instance, deftly combines the wackiness of the show’s various threads. “Swan Song,” of course, involves a bird attack. Only in Stars Hollow. Also known as the “Rory goes to college,” season, what’s most impressive about the fourth year of the show is how smoothly it manages to relocate Lorelai’s daughter in a completely different city without feeling like it severed the key connective tissue of the series. If anything, the season strengthens their relationship, with the occasional frustrations of not being able to reach each other to discuss their lives (which reaches its emotional nadir in “The Incredible Shrinking Lorelais”) reaffirming their need for one another. Also, one of Lorelai’s most significant relationships has the misfortune of occurring just before she gets together with the romantic foil the series had set up for her from day one, with season finale “Raincoats And Recipes” finally seeing Luke and Lorelai unite. Still, Jason “Digger” Stiles is a great comic foil (and winningly played by Chris Eigeman), but between his new business partnership with Richard and Luke’s increasingly stilted relationship with his unexpected wife, Nicole (not to mention Paris and her much-older professor beau), the season’s love pairings don’t end well—and that’s not even addressing the atomic bomb of Dean’s nuptials. The shocking act that Rory ends season four with turns out to be only the beginning of her troubles in a season that could be subtitled “Rory’s Descent.” She quickly gets besotted by smarmy Logan Huntzburger (Matt Czuchry, who somehow redeemed himself on The Good Wife) and his insufferable band of rich kids: The Life And Death Brigade is a name that brings involuntary retching to most long-time Gilmore Girls watchers. As Rory gets in deeper with this shallow new crowd, she finds herself losing her grip on all the things that made her Stars Hollow’s favorite daughter in the first place, with devastating consequences. On the upside, we have Luke and Lorelai following up on the kiss that was actually worth waiting for in “Raincoats And Recipes,” as they attempt to carve an actual relationship after four seasons. Even though L&L (and Graham and Patterson) played fairly well off of each other, in the interest of drawing out the drama, the showrunners always found frustrating ways to pull them apart. This comes to a head in season five’s high point, “Wedding Bell Blues,” encompassing Lorelai, the dreaded Christopher, Rory, Logan, and a final showdown with Emily and Richard, followed by the breakup devastation of “Say Something.” But even though we never got Luke-and-Lorelai happiness for too long, moments like “Written In The Stars” were awfully good while they lasted. The season also offered some valuable highlight episodes for Melissa McCarthy (“Norman Mailer, I’m Pregnant!”) and Kelly Bishop in light of Richard and Emily’s temporary separation (“Emily Says Hello,” “Come Home”). In its sixth year, Gilmore Girls gives viewers something they’ve always wanted, and takes away something they’ve come to depend on. Yes, Lorelai and Luke are finally together, but it takes the trauma of Rory a) stealing a yacht and b) dropping out of Yale to push them together. As a result, Lorelai and Rory aren’t on speaking terms for half of the season, a little bit of history repeating that saps the show of some essential energy. The show recovers in time for the Sherman-Palladinos’ original send-off to their creation, a comeback that peaks with the unorthodox editing and electric camera work in “Friday Night’s Alright For Fighting.” Unfortunately, this is also the season that gives Gilmore Girls its very own Cousin Oliver—Luke’s previously unseen daughter, April Nardini (Vanessa Marano)—so beware any hour where the future Switched At Birth star shows up in the credits. Gilmore Girls is not the first TV series to part with its creator midstream. Gilmore Girls will not be the last TV series to part with its creator midstream. But not every ousted creator made it known that she had planned the end of her series down to the last four words. So a Gilmore Girls without Amy Sherman-Palladino was always going to be a tough sell—and an even tougher show to make, judging by the opening installments of season seven. With Lorelai and Luke on the rocks at the end of the previous year, the remaining writers steered their ship into the choppy waters of a Lorelai-Christopher reconciliation, cinched with a quickie wedding in Paris. (France, not Geller. She’s too busy deciding between med school or law school—and possibly dumping Doyle to make the choice easier—to host any weddings.) It’s an awkward stumble to the end of Rory’s time at Yale, which picks up some confidence whenever both generations of Gilmores pull together, be it for out-of-town nuptials or a medical emergency. And though it doesn’t contain Sherman-Palladino’s legendary parting words, “Bon Voyage” is a fitting capper to Gilmore Girls’ original run.